Fayetteville Observer: Fayetteville Academy basketball standout Zane Waterman, a 6-foot-8 senior with perimeter skills, committed to Manhattan on Sunday. Waterman, who has received roughly 10 Division I scholarship offers, averaged 25.9 points and 11.7 rebounds while leading his team to an 18-9 record as a junior. He recorded 18 double-doubles and was named to the NCISAA 2-A all-state team. Waterman narrowed his list of finalists to Manhattan, Charlotte and Saint Joseph's last month before declaring that he was re-opening his recruitment. He took an official visit to Manhattan over the weekend and met up with Brooklyn Nets rookie Mason Plumlee, a former Duke star, after dinner on Saturday night. "He had a great visit, was very impressed with everything," Fayetteville Academy coach Justin McClendon said. Boston Herald: Central Catholic senior guard Tyler Nelson has just confirmed via his twitter feed that he will attend Fairfield on a basketball scholarship. He took a trip there a few months ago and fell in love with everything about the school. "I really liked the campus," Nelson said. "I met the coaches and really liked them. I think I can go there and have a chance to play as a freshman. I also liked the academics, I'm looking at business and a few other things (to major in)." A 6-foot-2 sharpshooter, Nelson averaged 16.2 points per game and was named to the Merrimack Valley All-Conference Team as the Raiders won the MVC Large and Division 1 North sectional title. He enters his final season with 926 points. An honor roll student, Nelson also earned All-Scholastic honors in golf this fall, winning the MVC championship and finishing fifth in the sectional final. Making the decision will allow him to focus solely on Central Catholic in his final campaign. "That was a goal of mine, to make a decision before the start of my senior year," Nelson said. "Now that this is done, I can concentrate on my golf and basketball." NERR: Hyde School's six-foot-eight rising senior big man Kenny Grant made a verbal commitment to Rider on Tuesday night. Grant, who doubles as a two-sport athlete at Hyde, is a product of the Sports U grassroots program and also attended the Reebok Breakout Classic earlier this summer. He saw wide-ranging recruitment, including schools like Wichita State and George Mason, but ultimately decided to return closer to his New Jersey home. A physically powerful and left-handed post player, Grant is an outstanding interior defender and rebounder. Zags Blog: Bashir Ahmed, a 6-foot-6, 182-pound wing from Bronx John F. Kennedy High School, committed to Iona Monday while on a visit. 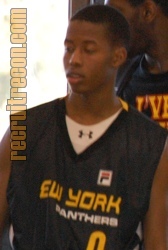 Ahmed also helds offers from Norfolk State, Morgan State, Hofstra, FIU, Buffalo and Manhattan, he said. NBC Sports: Well-traveled JuCo standout Chris Thomas is no longer going to attend Manhattan and is instead headed to Marshall to play his college ball, according to a report from Jon Rothstein, who spent the day at Manhattan’s practice. Thomas’ status had been up in the air at Manhattan. He’s got a long history of academic issues and was violated his conditional released stemming from driving an unregistered vehicle without a license when he tested positive for marijuana. He was in jail during Chipola Junior College’s trip to the JuCo National tournament. New York Post: Steve Masiello has built Manhattan into a MAAC contender in two short years, and he’s done so with local products. Moving forward, the plan doesn’t seem to be changing, either. The Jaspers landed talented Nazareth duo Samson Usilo and Samson Akilo Wednesday night, building on this year’s highly thought of recruiting class. Later in the evening, Manhattan added a third recruit in one day in wing Calvin Crawford from Middleton, N.Y., according to a source. The 6-foot-7 standout, recruiting by new assistant Matt Wilson, will attend prep powerhouse St. Thomas More in Connecticut this year. Zags Blog: Iona has signed 6-foot-11 Daniel Robinson, a former FIU commit who decommitted after the coaching change there. Robinson said he chose Iona for one reason. “To summarize into two words: Coach Cluess,” Robinson told SNY.tv of head coach Tim Cluess. New York Post: Wesley Myers won a pair of city championships, but his greatest accomplishment came away from the court. It was in the classroom, where the recently graduated Boys & Girls 6-foot-2 combo guard truly got it done. Myers verbally committed to Niagara this week, and barring something unforeseen, will become the first Boys & Girls player to go straight from high school to Division I in four years. Boys & Girls coach Ruth Lovelace told The Post Myers is a qualifier after finishing strong and getting the required SAT score, snapping a recent trend of academic shortcomings at the school for star basketball players. Buffalo News: Canisius College on Wednesday picked up a 2014 verbal committment from 6-7 small forward Cassidy Ryan of Mt. Carmel High School in Mississauga, Ont. The earilest Ryan can sign with Canisius is Nov. 2013 and a lot can happen until then but the Griffs may have landed a steal if they can sign Ryan.